Even though we have to wait until the holidays to get the next chapter of the Ron Burgundy tale, that doesn’t mean we can’t start prepping now. The stars and surprise guests recently filmed a giant fight scene in Atlanta, revealing a ton of amazing actors that are stepping into the project. We made a countdown to the best of these surprise guests and what we know so far. The other half of Kimye was in Atlanta to film his surprise cameo. Kim was far enough away from the action, but came to set with her baby daddy. The fight is a nod back to the first Anchorman when Ron Burgundy and the Channel 5 News Team went up against every other news channel in town. John C Reilly starred alongside Will Ferrell in the Talladega Nights: the Ballad of Ricky Bobby. Here’s hoping they bring the shake and bake back together. I’m interested to know why he’s on set dressed as a confederate general. This is just a stab in the dark, but wouldn’t it be great if Liam Neeson played the tough cop or an anchor that specialized in kidnappings? He’s been seen on set with a sword in hand. While Veronica Corningstone is our favorite blonde anchorwoman, Kirsten Dunst could give Christina Applegate a hilarious beat down. Of course, Corningstone would win but wouldn’t it be great to see this scenario go down? One of the best looking men in Hollywood, it’s no surprise that James Marsden is making a cameo. He’s been seen on set with an ax battling a werewolf. Jim Carrey might be the chameleon in Hollywood. He’s transformed from the incredibly polished character to a freaky, green Grinch. Imagine a perfectly coifed anchorman turning into a screaming, spitting mad man. Kristen Wiig is playing Steve Carrell’s wife in Anchorman 2. Brick Tamland was the mentally challenged weatherman that charmed bears. We know that Harrison Ford is playing a legendary newscaster in the sequel. He’s been seen on set with Ferrell, both in dapper suits. In a rare feat, the entire original cast of Anchorman is back. Paul Rudd, Steve Carrell, David Koechner, Christina Applegate and Will Ferrell are suiting up again. Stay classy San Diego. Even though it’s amazing that the entire original cast came back to for this sequel, We’re most excited to see Amy Poehler and Tina Fey do a tag team scene. 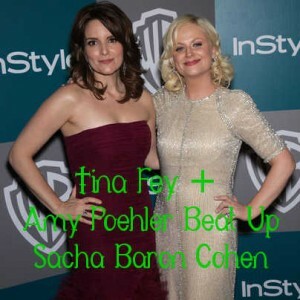 Dressed in wool suits that Jackie O would covet, Fey and Poehler use an old pipe and a tire iron to beat the Borat out of Sacha Baron Cohen. Dreams are coming true.